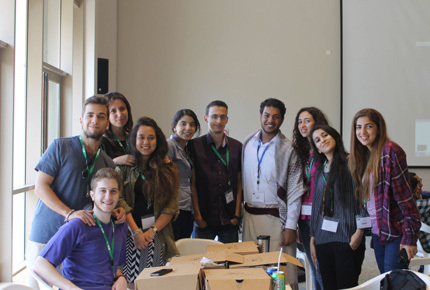 LAU introduces and greets 22 new MEPI-TL students in a day-long retreat at the Byblos campus. Students bond during the meet and greet session. A West African drum session was used to teach balance, discipline and respect. 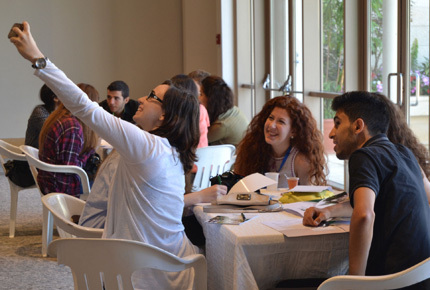 The incoming freshmen students of the LAU Middle East Partnership Initiative-Tomorrow’s Leaders (LAU-MEPI TL) program have just started off their year with a day-long retreat at the university’s Byblos Campus. “I am confident that this new experience is going to be amazing and LAU is the perfect place for it,” says Ali Zughdani an incoming MEPI TL student of Libyan origin. LAU-MEPI TL is a leadership program jointly sponsored by the United States Department of State and LAU, and managed by the University Enterprise Office (UEO). Students from the region are funded to pursue studies at LAU followed by two internships in their home country, or Lebanon, and to study for a semester in the US. Included in the program are workshops and conferences that aim to improve the student’s leadership skills. 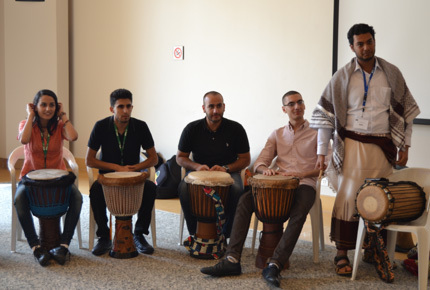 To start off the semester, old and new LAU-MEPI TL students joined in activities that promoted team building and helped foster ties between them. The meet and greet session revealed the good, the bad and the ugly about their fellow classmates. Then during a West African drum session, the students learned discipline, balance and respect. After which they spent an hour dancing to learn about the art of alternative communication. Such activities are an example of the workshops the students are expected to attend throughout their time at LAU, indicates Rola Nader, senior administrative coordinator of the program. According to Nader, “It’s about equipping students from the MENA region with excellent academic skills as well as leadership communication skills that build their character to become active citizens in the future.” Emphasizing his hope to pursue music, for Syrian national Zolfiqar Belal, studying at LAU “is not only about the education, it’s about student life, the clubs and all the extracurricular activities.” Both Belal and Zughdani come from countries that are new to the LAU-MEPI TL program . Copyright 1997–2019 Lebanese American University, Lebanon.